Most film distributors and media companies argue that you can't decrypt and rip commercial DVDs for any reason, even legally. And we customers get DVD decryption from the perspective of another. That is, if we own a DVD and want to keep it well from damage or loss, then we should resort to a reliable tool to decrypt and copy DVD to computer or handheld devices for backup or personal legal use. Currently, there is a grey zone between the two. So here comes our suggestion: if you don't own a DVD, don't do it; if you do own one, think twice before you copy protected DVD. Dying to set your encrypted DVD movie free from the plastic-mental prison for playback on iPhone iPad on the go? Needless to look at elsewhere, just shift your eyes to the world-famous Handbrake, which is the ideal DVD ripper open source for you to decrypt and rip DVD with 100% free of charge on Mac, Windows and Linux. No wonder Handbrake wins almost 0.4 million searches on Google and thousands of download every day. Best Handbrake alternative to decrypt any kinds of copy-protected DVDs and fast rip commercial DVDs to MP4, AVI, MOV, H264, MPEG4, MKV, etc without any DVD decrypter software. Case 1: If you are running Handbrake to rip commercial new DVD movies encrypted by CSS, then you need to install the 3rd party libdvdcss to skirt the Content Scramble System applied on DVD. In such case, Handbrake decrypting DVD movie can eventually come true. Case 2: After you wield Handbrake to rip encrypted DVD with VLC media player installed, you may think Handbrake now is capable to circumvent any common DVD copy protection tech like Region Code, UOPs, etc. Unfortunately, the truth is that the Handbrake still delivers unstable performance in ripping and decrypting encrypted DVDs. The most common Handbrake error in ripping 99 title DVD; Handbrake fail to find the valid source; Handbrake audio video out of sync problem, Handbrake DVD reading error, HandBrake libdvdcss.dll not working issue, Handbrake no title found error…..are the best proof. Case 3: Assuming you are a Mac user running on macOS Mojave, regret to inform you that Handbrake is not your cup of tea since the latest Handbrake only keeps abreast of the Mac OS X 10.6-10.14, not compatible with the newest macOS 10.14 Mojave. So it's sensible for you to resort to the advanced Handbrake alternative. Handbrake to Decrypt DVD Loads of Troubles, Any Killer Handbrake Alternative Suggest? Given the Handbrake to rip DVD with so many troubles, it's advisable to seek for the best Handbrake alternative to smoothly rip any encrypted DVD without any third party or plug-ins bothered. If there is such a perfect handbrake alternative? No doubt Yes. 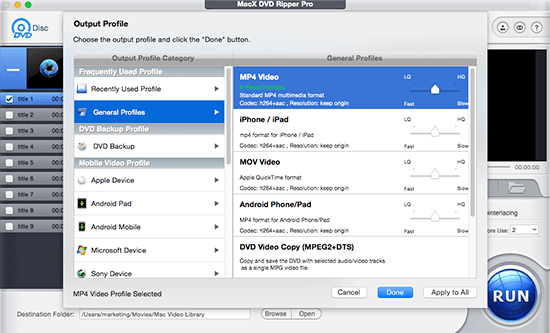 The highly sought-after MacX DVD Ripper Pro is the very one you are looking for, which can seamlessly decrypt any copy-protected DVD on Mac (Mojave) as 1-2-3, no matter the DVD encrypted by CSS, Region Code, RCE, UOPs, Sony ARcoSS, or even Disney Fake; it can make the whole DVD decrypting task done within mins and zero quality compromising thanks to its hyper-threading tech, multi-core CPU and High Quality Engine supports. And to satiate your basic needs, this multi-purpose DVD ripper Mac also authorizes you to hassle-free rip and convert copy-protected DVD to MP4, MOV, AVI, MKV, FLV, etc. for playback on your iPhones, iPads, iPods, Samsung, HTC, Sony, etc. so that you can watch the latest DVD movie Captain America 3, Disney Zootopia, The BFG, The Martian, etc on your portable device while moving around. Step 1: Load DVD by Clicking "DVD Disc" or "DVD Path"
Free download and run this Handbrake for Mac OS X 10.12 alternative on Mac, click "DVD Disc" or "DVD Path" button to import the DVD you want to decrypt on your Mac. Turn to Windows version if necessary. Choose the desired output video from the pop up interface. Here selects "to MP4" as the output format. You are also free to decrypt and rip DVD to your portable devices such as iPhone XS/XR/X/8/7/6X/6/5S/C/5, iPad mini 4, Android, etc. Click the "Browse" button to find the destination folder to save the output files. Hit the "RUN" button to start to rip DVD to Mac with the optimal Handbrake alternative. You can view the whole progress and are able to cancel it at anytime. More reference: Actually, this second-to-none Handbrake alternative can do more than what you can imagine. Beyond flawlessly decrypting DVD on Mac, this first-tier DVD decrypter for Mac Yosemite also functions well in copying DVD with main/full title, backing up DVD to MKV with high quality and cloning DVD to ISO image for later burning or something. BTW, after ripping DVD to MP4, MOV, AVI, etc, you can use the first-rate mobile data transfer - MacX MediaTrans to move converted DVD content to iPhone iPad iPod for playback on the move. Futhermore, this iPhone transfer also can aid you to transfer photos, eBooks, music, ringtone and more data between iDevices and computer. Notice: The software company only advocates copying and ripping DVDs under the concept of Fair Use and does not encourage any illegal reproduction or distribution of copyrighted content. Please abide by the local DVD copyright law before doing it. The article offers Handbrake deinterlacing video guidance to teach you how to deinterlace videos with Handbrake, and solve Handbrake deinterlacing interlaced video problems. Handbrake supports to convert DVD to MKV VP9 free on both PC and Mac. Yet, accident always happens. Handbrake might half crashes during DVD to MKV conversion. In such case, you can consider to shift to another Handbrake alternative - DVD ripper from MacXDVD to get DVD ripped to MKV format. Check the most Handbrake 1.0.0 errors and solution here. This Handbrake 1.0.0 errors collection listed all kinds of problems after upgrading to Handbrake 1.0.0, as well as the corresponding Handbrake 1.0.0 troubleshooting solutions to ensure a smooth running on Handbrake. MacX DVD Ripper Pro, sought-after alternative to Handbrake DVD decrypter to effortlessly remove any DVD copyright protections and copy/rip DVDs to ISO image, MP4 MOV AVI FLV MKV dozens of formats with original quality reserved.